Mar - 10 | By: Katherine Wilson | 3 comments. Produced by Dr. Carter Soles, the Indy film incubator Fleem Productions announces the release of “A Tale of Persephone,” their second fiction film. A film noir coming-of-age story, this artsy adaptation of the mythic transformation of the Princess of the Grain into the Queen of the Underworld follows up Fleem’s debut, the award-winning 2008 sci-fi parody “Spidertron”. Shot on location in Oregon, “A Tale of Persephone” features backdrops in Eugene, Portland, and Lowell. The film is set to a stunning soundtrack packed with renowned regional and international performers like Halie Loren, Ben Darwish, and The Parson Red Heads, as well as NYC musicians Jonathan Pieslak and Æ.
Fleem Productions is a collaboration of filmmakers who met while attending the University of Oregon. Directed by accomplished documentary filmmaker Emily West Afanador, “A Tale of Persephone” was written by English Ph.D. candidate Kom Kunyosying, produced by Dr. Carter Soles, now a professor of Film Studies at SUNY Brockport, and lensed by award winning Digital Arts graduate Nate Sparks, who also shot “Spidertron”. The cast features English and Film Studies graduate Cody Yarbrough, who edited “Spidertron” and is an award-winning professional screenwriter. 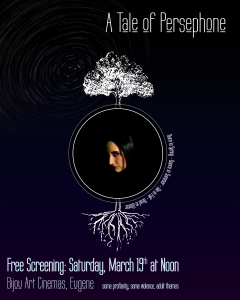 “A Tale of Persephone” will premiere at noon on March 19, 2011 at the Bijou Art Cinemas. The screening is free to the public. The film includes some profanity and violence, and contains adult themes. Parental Guidance is suggested. Actually I just POSTED this article, it was written by the filmmakers. Thanks for spreading the word, Katherine!